This is an article written by my friend in Chicago. Take a minute to enjoy it – it’s a quick read. There is so much to appreciate! Thanks, Debbie! Can We Enjoy the Holidays More on Less? How Can I Afford the Holidays? As we approach the upcoming holiday season, the economic recession may cause many of us to ponder, more seriously than ever, the question: How can I possibly afford the wants and desires of my loved ones? Close on the heels of this question is: How can I experience joy, knowing that so many people are facing even greater hardships than us? Unemployment is nearly at 10% across our nation and in some cities like Detroit, it is nearly 17%. We haven’t seen jobless rates this high since the Great Depression, which was 25% during the late 1920’s and early 1930’s. What are people going to do about gift-giving this year? Will they make homemade items, re-gift and/or look for bargains on eBay or at their local thrift stores for their friends and family? Perhaps they may pull out the plastic more frequently than in years past and charge a few items here and there, or just skip the holidays all together and become a Scrooge. Not knowing exactly which approach I will be taking myself this year, I thought I would explore the options and try to find a few ideas for gifts. Keeping with the times, I thought I would consult with my buddy “Google” who knows something about everything. “Google” helped me find multitudes of awesome gifts, which is great—if you can afford them—but many people, myself included, cannot. Something was missing as I did my search with “Google”. I think it was the human emotional connection; there wasn’t any. So, I continued my quest, and like all good writers, I revised my original intent. Instead of figuring out how to buy the perfect holiday gift I sensed I was being drawn to the heart of the matter: How can we enjoy the holidays on a shoe string? Low and behold I found the answer via the assistance of Gayle Fahey, the Director of Altenheim, which is an Independent Senior Community in Forest Park. When I called, I asked Ms. Fahey if there was anyone there who might be old enough to recall life during the Great Depression. My thought was that there are so many parallels between then and now, surely I could gain some insight into how people made it through those difficult times and enjoyed the holidays. Ms. Fahey said that Edna Mae Kleinfall, who has been a tenant for over eight years, would be happy to speak to me. Thrilled by the opportunity to speak with a woman who has lived on planet earth for nearly a century, I couldn’t wait to meet her. We sat together for several hours in a common room that was toasty and warm, and we sipped iced tea that Ms. Fahey provided. Edna Mae spoke about work, family, holidays, and her travels to every continent in the world. Relevant to my search, she also talked about what life was like for her during the Great Depression. She shared her thoughts about life then and now with an unbridled joy I wouldn’t have expected from someone twice my age. She stands with pride and grace about 5 feet tall. Her hair is silver, and she has brilliant beautiful blue eyes that are slightly hidden by her brown bifocals. Edna Mae was born in a small Illinois town called Spring Valley in 1913. She was the second oldest of five girls and one boy. Her father had to leave school and began working in the coal mines at age 13, and he “was a wonderful man,” she said. He worked very hard to provide for them before the Great Depression began in 1927 and even harder after. In spite of excruciating pain due to a malformation in his feet, he persisted in providing for his family. His dedication, strong work ethic and ability to persevere, while enduring extreme physical pain, I believe had a profound impact on Edna Mae. She is a firm believer that when you work you should do it well or not at all. In 1920, her family moved to Wenona, Illinois, so her father could continue to work in the mines. They rented a home for $10 a month and stayed there until 1925, when the mines closed. Her family then moved back to their home in Spring Valley, which they still owned. She said for most of the folks the Depression began in 1927, but for them the hardships started two years earlier. Nevertheless, Christmas was always a wonderful time each year, and her parents worked well together, and the holidays were no exception. “Before 1927, we would always receive only a gift or two and that really didn’t change for us during the Great Depression. Santa always gave us something that we needed or could use. We might get something to wear and a card game. I always got the card game “OLD MAID”. I would just wear my cards out. My parents would also try to get us a board game that we all could play it together on Christmas. We usually attended church on Christmas Eve. Each of us would carefully unwrap our presents that were left the night before, making sure not to tear the paper, so we could reuse it the following year,” she recalled. “We are a country built on credit. Everyone wants to keep up with Jones, and it is not possible. When things were going well in our country, adults and children alike got what they wanted. When I was a young girl, I always remember my father saying to me, ‘Edna Mae if you can’t pay for something in CASH, don’t get it.’ Today a lot of people will spend every penny they get and never think of saving any. If they can’t afford it, they will charge it. That is why we are in the credit card crunch now. I would never have dreamed of spending my entire paycheck and not saving something. Sure, there are a lot of things that I would have liked to bought, but didn’t because I could live without them. I never spent a lot of money on clothing and fine jewelry, but I saved and traveled the world,” she said. Edna Mae worked several jobs during the Great Depression for little or no money, even when she worked overtime. Her hourly wage in 1932 was twenty cents for a sign company. When the company she worked for declared bankruptcy, they owed her $85.00 in back wages, which was a lot of money in those days. They offered her $12 and she wouldn’t accept it, out of principle. Edna Mae has no children of her own and chose never to marry, but she has several nieces and nephews. She and her older sister Anne decided it was their responsibility to help their mom raise her younger brother and sisters after their father died in 1932 of a heart attack. In 1937, she moved to Chicago to join her family and worked several jobs before retiring as a secretary for an Industrial Relations Director in 1974. As I was nearing the conclusion of my interview, I asked Edna Mae if she would mind if I took a photograph, so that I could show the readers whom she was. 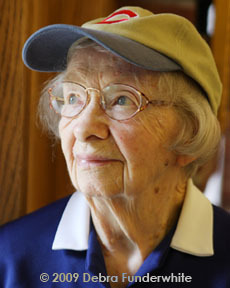 She said, “Oh no, I’m having a really bad hair day.” I suggested that perhaps she wear a hat and Ms. Fahey said, “Edna Mae you have a Cubs hat that you could wear.” So, Edna Mae went to her room and returned wearing it. I had to chuckle; she was just too adorable. As I photographed her, she explained that she is an avid Cubs fan and that she takes the Elevated Train about eight times a year to watch the games by herself. Now that is a true fan! I don’t even like to take the EL myself, but Edna Mae at the wonderful age of 95, still manages to show us all what team spirit is all about, not only in sports but in life. Edna Mae is a delightful soul, and she epitomizes what I was seeking when I began my journey: “How can I /we experience joy in such trying times?” I feel that I was truly blessed getting to know her. Seeing how in our current society, and across this nation, where more is never enough and materialism replaces authenticity, it is my hope that everyone can learn from Edna Mae the lesson that less is more. Surround yourself with loved ones, play games, reminisce and remember that quality time spent together will always trump quantity of things. “Your life does not consist in the abundance of your possessions” (Luke 12:15). I hope you all enjoy the Holiday Season to its fullest. Photo of Edna Mae, courtesy of Debra Funderwhite.